I like to play with color and I love to be surrounded by bright colors. Do not let anybody convince you that the Middle Ages was just a drab brown and gray world, it may not have had neon colors but there was color. 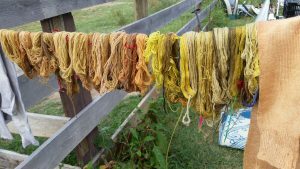 I have played around with natural dyes off and on for years. Most recently I have been running a bunch of dye tests with different mordants. 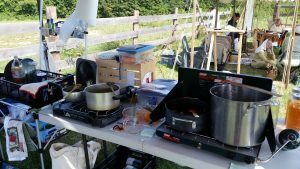 A semi-local event near us is called Fiber, Foliage and Forge (each year they add an F.) I have brought a portable dye set up to demonstrate and teach for the past 3 years. You can see a picture of my gear above. Unfortunately it is all modern, mostly due to cost and portability, plus safety. While I enjoy dying it does not make for a good display area. It is messy, needs a lot of water, it is hot and frequently stinky. It does not require spit, one of the better ingredients in most craft projects. But it is still fun. Most of the time folks stop by multiple times per day to see what I have pulled out of a pot. 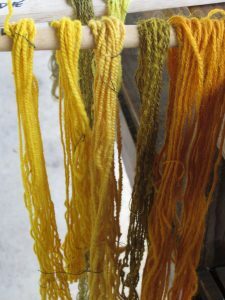 I do not take as accurate notes as I should, but I believe that the color on the skeins to the right is coriopsis. A flower that grows in my garden. You only use the petals from the flower, so it takes a lot to dye the yarn.